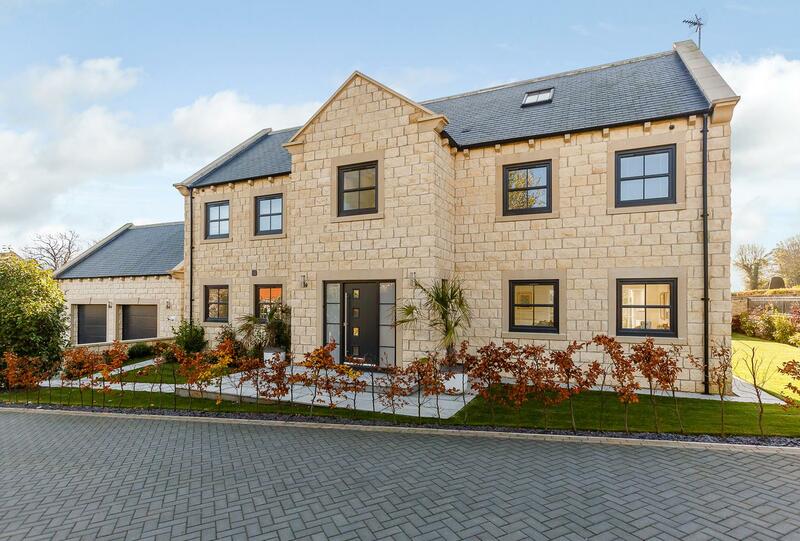 A fabulous opportunity to purchase this recently constructed, stone built property, forming part of a unique, gated location, comprising only two properties and being adjacent to open countryside. The property has been individually designed and offers extremely spacious and versatile accommodation, extending to approximately 4,600 sq ft, with today’s lifestyle very much in mind. The property truly warrants an internal inspection to appreciate the beautifully presented accommodation, which is laid out over three floors and has high quality fittings and fixtures throughout. Comprising, on the ground floor: Extremely large, welcoming entrance hall with magnificent oak and glazed staircase with stone feature wall below, cloakroom, magnificent living room with large picture window overlooking the rear gardens, family room with double opening doors, a truly stunning fully fitted and integrated breakfast kitchen with sitting area and utility room with access to the attached double garage with separate wc and staircase to a large home office, which has the benefit of plumbing for a further bathroom, subject to the buyers requirement. This would be ideal as an au-pair suite, guest suite or further accommodation. The first floor comprises: The master bedroom has a spacious sitting area with doors leading to a good sized balcony with far reaching views, large dressing room and beautifully appointed en-suite bathroom with walk through shower, two further double bedrooms with en-suite facilities. The second floor comprises: Two further bedrooms, one with en-suite dressing room and the other and en-suite shower room. A small front garden area gives access to the side of the property. To the rear of the property is a good sized flagged patio with barbecue area and sitting and dining areas. Steps lead to a lawned garden area with well stocked borders and stone boundary walls. The rear garden adjoins open fields. From Harrogate take the A61 Ripon Road, pass through Killinghall and at Ripley roundabout take the Ripon exit. Follow the road through South Stainley and at the top of the hill turn right towards Burton Leonard (Station Lane). Copgrove Road is then a turning on the right where Green Meadows is situated on the left hand side. Burton Leonard is a popular village situated between Harrogate and Ripon, with many amenities including public house, village shop with post office, school and village green. The location is ideal for those commuting in the A1(M) corridor. The property has been paced in band G.